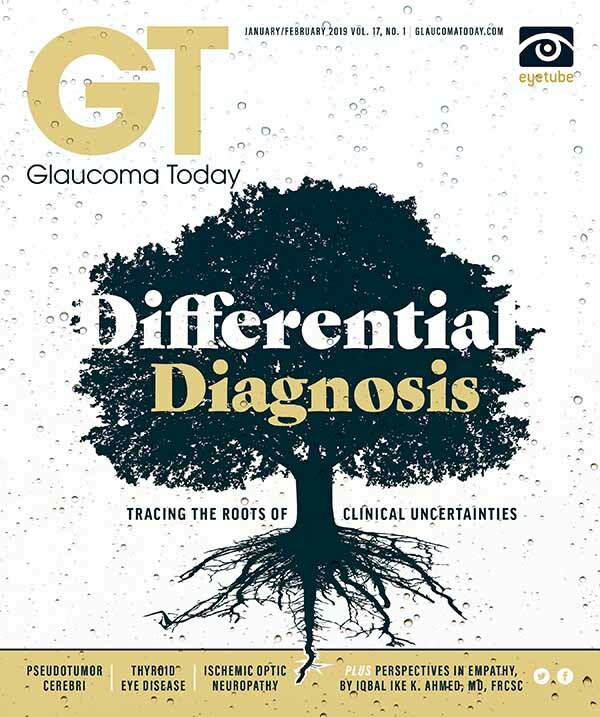 • Thyroid eye disease is commonly misdiagnosed; delayed diagnosis can complicate management. • Supplements and medical therapy may reduce disease burden and improve outcomes. A novel drug with a new molecular target has shown promise in a clinical trial. • In severe cases, surgery may be required to improve orbital and ocular function. Figure 1. Atypical example of thyroid eye disease with profound unilateral proptosis, hypotropia, and eyelid retraction. Figure 2. Another atypical example of thyroid eye disease presenting only with right upper eyelid retraction. Figure 3. An example of thyroid eye disease with disfiguring proptosis and lower eyelid retraction on both sides (A). 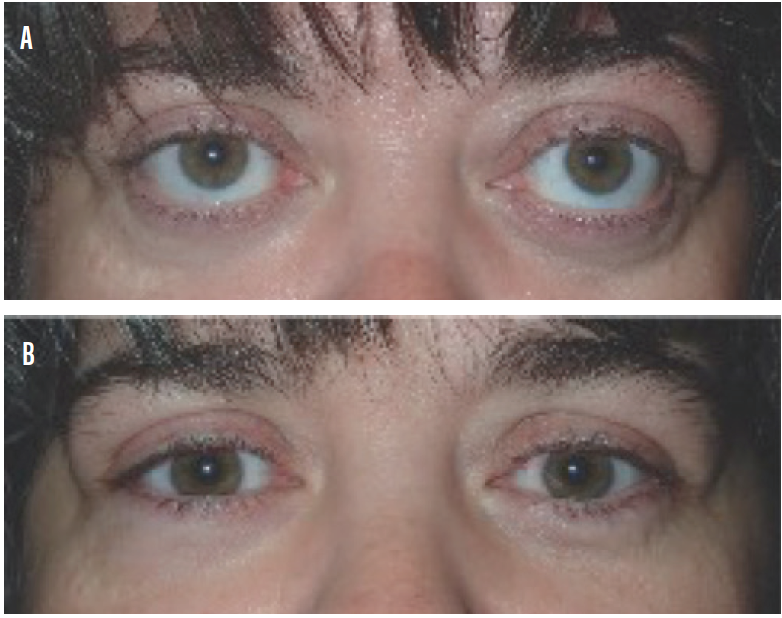 A postoperative photograph of the same patient following customized orbital decompression of the medial orbital wall, floor, and lateral walls on both sides (B). Figure 4. Active inflammatory thyroid eye disease with orbital congestion, chemosis, conjunctival and caruncular inflammation, proptosis, esotropia, and eyelid retraction (A). 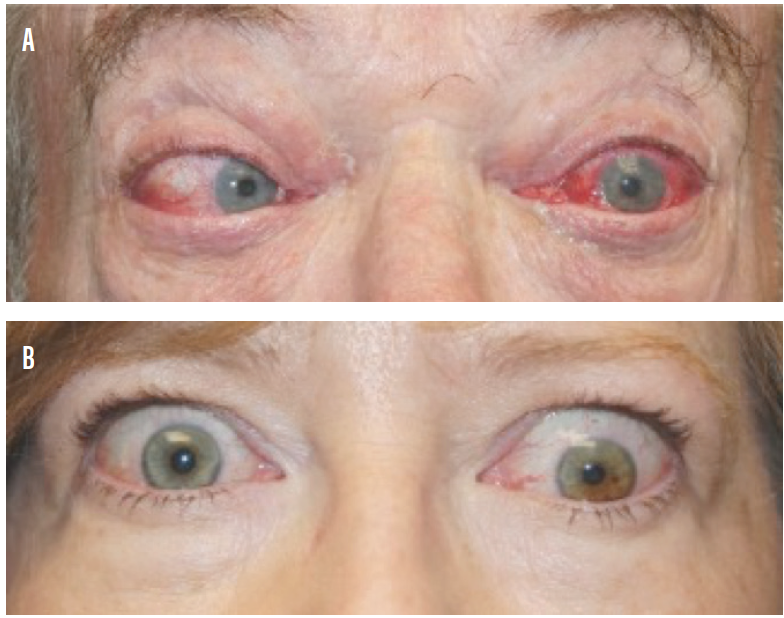 Active thyroid eye disease with bilateral proptosis, hypotropia, and extreme bilateral eyelid retraction (B). In that trial, teprotumumab (Horizon Pharma USA/Genmab/Roche), a human monoclonal antibody inhibitor of IGF-1R, was more effective than placebo in reducing inflammation and patient scores on a clinical activity scale. TED is commonly misdiagnosed, not only because of the heterogeneity of presenting symptoms and signs, but also because the thyroid gland symptoms and ocular symptoms can occur at different times. Early in the active phase, symptoms are commonly blamed on dry eye disease, conjunctivitis, or allergic eye disease. In the later stages, patients can be diagnosed with orbital cellulitis, myositis, and even sinusitis. Active phase findings occur rapidly and provide the best options for medical therapy in the disease process. In most patients, the changing phase of TED lasts between 6 and 18 months. Because of delayed diagnoses and a lack of specialists comfortable with treating TED, patients commonly miss the window when medical management of the disease is most effective. Current medical options for patients in the active phase of TED may lessen the overall disease burden and limit some patients’ severe disfigurement, vision loss, or need for surgical intervention. Medical therapy for active-phase TED remains the most highly researched area. Although corticosteroids and radiation can provide effective blanket treatment for the inflammation, they commonly cause adverse reactions. Therapy that targets ocular and orbital inflammation may allow more effective treatment with fewer adverse events. In TED, the thyrotropin receptor is a known stimulatory target for pathogenic autoimmune antibodies within the ocular and orbital tissues. There is a known regulatory relationship between IGF-1R and the thyrotropin receptor within orbital fibroblasts. In vitro studies have shown that inhibitory IGF-1R antibodies decreased the stimulatory role of pathogenic thyroid autoantibodies. Teprotumumab recently received breakthrough therapy designation from the US FDA for the treatment of moderate to severe TED. The 2017 study cited earlier,12 on which I was a coauthor, found that proptosis, clinical activity score, and quality of life were significantly improved in patients receiving tempromumab compared with placebo (see Study in Seconds). The only significant adverse event was hyperglycemia in some patients, which required adjustment of medication in some patients with diabetes. This was one of the first trials of targeted therapy for TED, and it has opened the door for additional research in active-phase TED. • Objective: Evaluate the clinical utility of teprotumumab and assess the drug against placebo for reduction of clinical activity and proptosis and improvement in quality of life. • Design: Prospective, multicenter, placebo-controlled trial. Following strict inclusion criteria, including evidence of active phase disease, the drug was administered once every 3 weeks for a total of eight doses. • Results: Greater improvement was noted in patients receiving teprotumumab than those receiving placebo at 6 weeks (43% vs 4%, P < .001). An even greater difference was seen at 6 months (69% vs 20%, P < .001). Proptosis, clinical activity score, and quality of life were significantly improved. • Side effects: Hyperglycemia required adjustment of medication in some patients with diabetes. Smith TJ, Kahaly GJ, Ezra D. Teprotumumab for thyroid-associated ophthalmopathy. N Engl J Med. 2017;376:1748-1761. Figure 5. 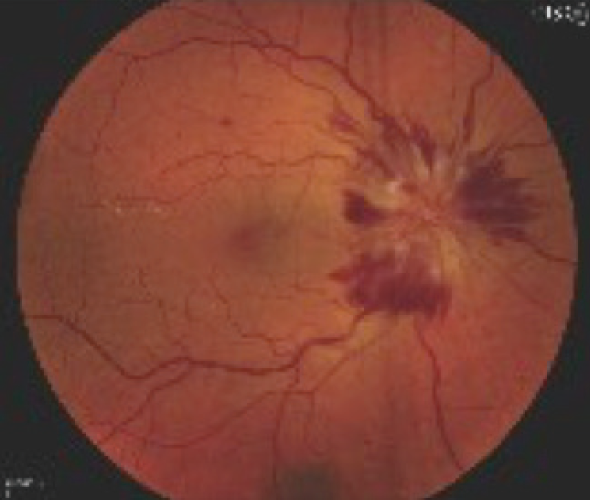 Severe right optic disc edema is seen only in advanced cases of thyroid-related compressive optic neuropathy. Figure 6. Coronal CT scan with classic pattern of extraocular muscle enlargement intensely involving the medial rectus muscles and less so the inferior rectus muscles. Figure 7. Postoperative coronal CT scan showing strategic removal of the entire medial wall, floor, and lateral wall of the left orbit with prolapse of the orbital contents through the osteotomies. Many times, medical therapy may reduce the disease burden in TED but not restore orbital and ocular function to the predisease state (Figures 5 and 6). As a result, rehabilitative surgery may be required. Unless the risk of permanent eye damage is suspected, orbital and periocular surgery should be avoided during the active phase to ensure the stability of surgical results. Surgical techniques and instrumentation have been greatly improved, now allowing surgery to be tailored for each patient. Preoperative orbital volumetric and orbital physiologic analysis may provide the adaptive surgeon the ability to better predict surgical outcomes. The introduction of intraoperative surgical navigation and instrumentation, such as piezoelectric bone removal systems, may afford safer, more strategic outcomes with orbital decompression (Figure 7). Algorithms developed for strabismus and eyelid surgery may improve ocular function and appearance. 1. Wiersinga WM, Smit T, et al. Clinical presentation of Graves’ ophthalmopathy. Ophthal Res. 1989;21(2):73-82. 2. Wiersinga WM, Smit T, van der Gaag R, et al. Temporal relationship between onset of Graves’ ophthalmopathy and onset of thyroidal Graves’ disease. J Endocrinol Invest. 1988;11:615-619. 3. Bartley GB. The epidemiologic characteristics and clinical course of ophthalmopathy associated with autoimmune thyroid disease in Olmsted County, Minnesota. Trans Am Ophthalmol Soc. 1994;92:477-588. 4. Stan MN, Bahn RS. Risk factors for development or deterioration of Graves’ ophthalmopathy. Thyroid. 2010;20(7):777-783. 5. Smith TJ, Hegedüs L. Graves’ disease. N Engl J Med. 2016; 375:1552-1565. 6. Bartalena L, Tanda ML. Graves’ ophthalmopathy. N Engl J Med. 2009;360:994-1001. 7. Gould DJ, Roth FS, Soparkar CNS. The diagnosis and treatment of thyroid-associated ophthalmopathy. Aesth Plast Surg. 2012;36:638-648. 8. Bartley GB, Fatrouechi V, Kadrmas EF, et al. Clinical features of Graves’ ophthalmopathy in an incidence cohort. Am J Ophthalmol. 1996;121:284-290. 9. Rootman DB. 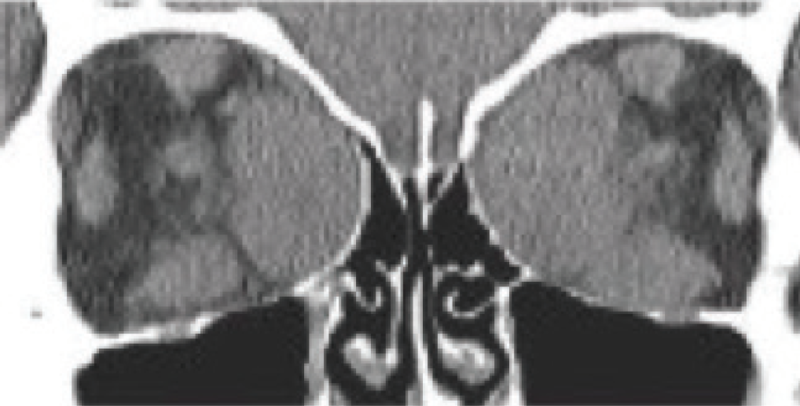 Orbital decompression for thyroid eye disease. Surv Ophth. 2018;63(1):86-104. 10. Jeffries Jm, Jones RK Currie ZI, et al. Orbital decomopression for thyroid eye disease: methods, outcomes and complications. Eye (Lond). 2018;32(3):626-636. 11. Marcocci C, Kahaly GJ, Krassas GE, et al. Selenium and the course of mild Graves’ orbitopathy. N Engl J Med. 2011;364(20):1920-1931. 12. Smith TJ, Kahaly GJ, Ezra D. Teprotumumab for thyroid-associated ophthalmopathy. N Engl J Med. 2017;376:1748-1761.